In association with UWE and the Bristol Natural History Consortium, Stoke Park is holding a Nature Outreach Day on Monday, May 25th from 1-5pm, featuring a day of family-friendly wildlife education and nature-based activities. 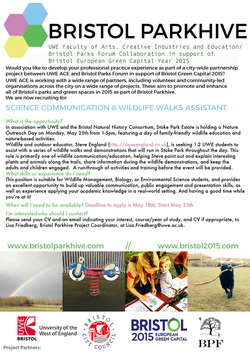 Wildlife and outdoor educator, Steve England (http://steveengland.co.uk), is seeking 1-2 UWE students to assist with a series of wildlife walks and demonstrations that will run in Stoke Park throughout the day. This role is primarily one of wildlife communication/education, helping Steve point out and explain interesting plants and animals along the trails, share information during the wildlife demonstrations, and keep the adults and children engaged. A run-through of activities and training before the event will be provided. Suited for: Wildlife Management, Biology, or Environmental Science students, and provides an excellent opportunity to build up valuable communication, public engagement and presentation skills, as well as experience applying your academic knowledge in a real-world setting. And having a good time while you’re at it! 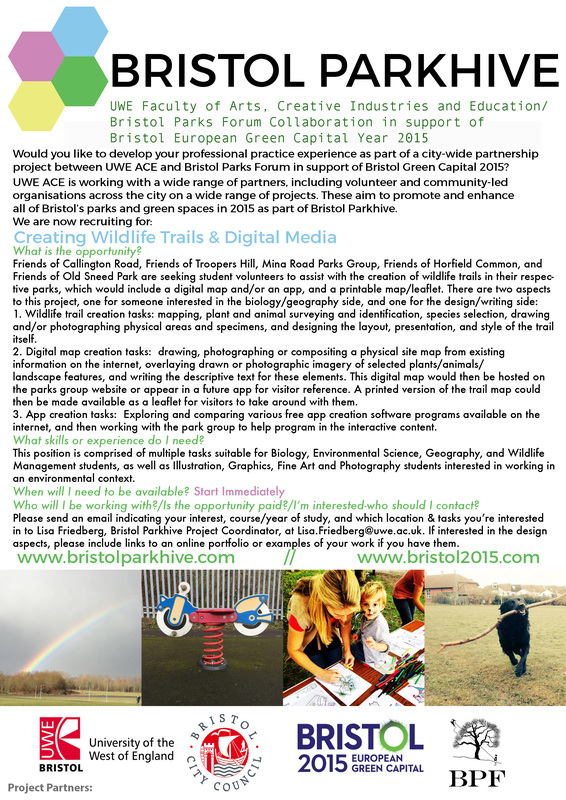 To apply, please send an email indicating your interest, course/year of study, and CV if appropriate, to Lisa Friedberg, Bristol Parkhive Project Coordinator, at Lisa.Friedberg@uwe.ac.uk.